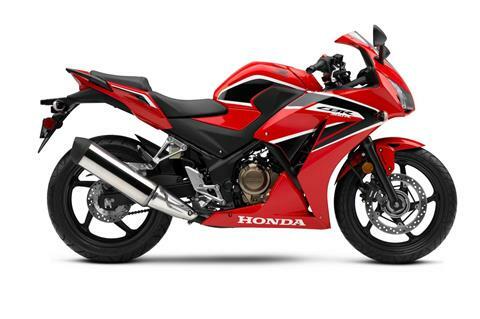 "The Honda CBR300R packs World Superbike looks with mid-range power and torque for twisty-road playtime. The narrow single-cylinder machine has a low 30.7-in seat height for shorter riders, with a MotoGP-esque 357-lb curb weight. The CBR300R is powered by a six-speed 286cc liquid-cooled single-cylinder four-stroke engine. The Pro-Link single shock on the rear gives five positions of spring preload adjustability to accommodate all riders and road conditions. Additional features include computer-controlled digital transistorized ignition, an estimated 71 mpg, programmed fuel injection.